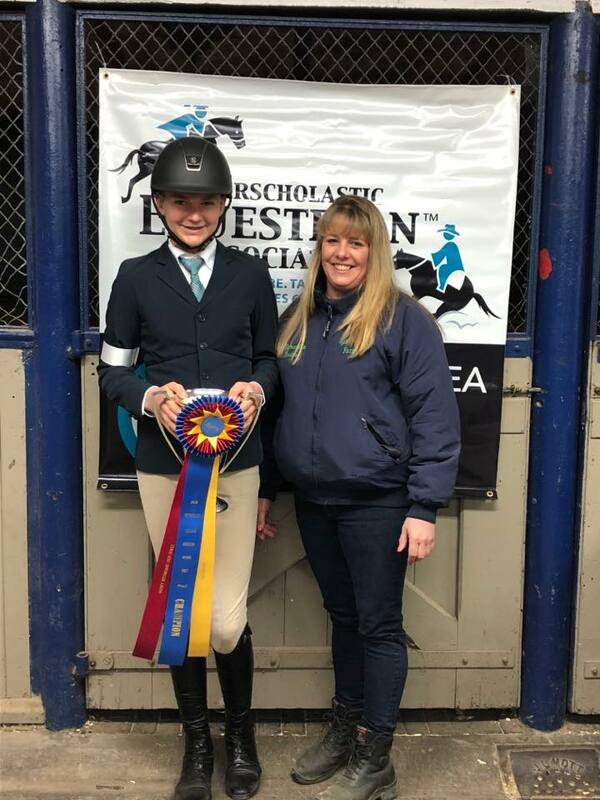 Riley Babb, a member of the IEA (Interscholastic Equestrian Association) Equestrian Team at TerryAllen Farms in Terryville is now the reigning IEA Hunt Seat National Finals Champion for the Varsity Intermediate 2’ Over Fences class. Reprinted from the Bristol Press. IEA is made up of two teams: Middle School and High School. Samantha Borkoski of Terryville has coached the TerryAllen Farms IEA team for the past 13 years. The teams start their new year in August with weekly practices. Although Riley has a favorite horse named Shamrock at TerryAllen Farms, which he rides in other competitions, at IEA shows they assign you a horse you’ve never ridden before, which makes it more challenging, his mother Jill Babb explained. Riley’s goal was to accumulate at least 18 points at five regular IEA shows held between October and January, Babb said. He was then able to compete at Regionals, which were held at TerryAllen Farms in February, where he placed first. This enabled him to move on to the Zones competition in March held at the Big E in Springfield, Mass. He again won the class at Zones which qualified him to compete at National Finals in Syracuse. The IEA posted statistics showing that 1,876 riders throughout the U.S. competed in this class to qualify for Finals, and Riley made it to top of the class, she said. All of Riley’s hard work, dedication, and hours of riding and lessons have gotten him to this accomplishment, Borkoski said, noting that she is very proud to be his coach and the coach of the TerryAllen Team. Borkoski added that she is very proud of all of her riders and their accomplishments this past season and looks forward to the upcoming IEA season. “I am so lucky to have this opportunity thanks to my parents, my good friend Abby Krudwig, and all my other teammates,” he said. Riley added that he is looking forward to the 2018-19 IEA year. Babb said Riley attends Wamogo for its agricultural program. “They do have a riding team there but they ride Western and he does English jumping, it’s different,” she said. He hasn’t decided yet what he wants to study in college, “but it will be definitely be something with horses,” she added. Riley’s love of animals extends beyond horses. His mother said last year the family went to Virginia for another riding competition and he wanted to get some ducks while they were there but he had to settle for hamsters.